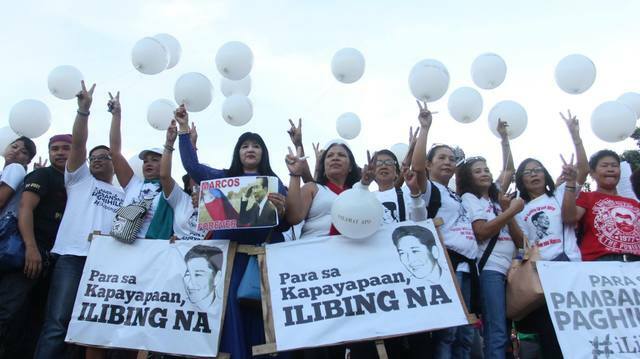 MANILA, Philippines – Supporters of the late strongman Ferdinand Marcos have urged the Supreme Court (SC) to allow a hero’s burial for the former president, saying this would pave the road for peace and national unity. 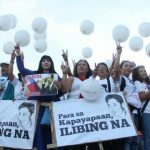 Marcos loyalist groups such as the United Marcos Loyalist of the Philippines (UMLP), Kilusang Kaisipan at Diwang Pilipino, and the BBM Youth Movement are set to submit a manifestation to the High Court signed by thousands of supporters on Tuesday, September 27. UMLP president Vince Avena said that their manifestation stresses on “forgiveness” so the nation, he said, can move on. “Whatever former president Ferdinand Marcos has done in the past, the Almighty God has already judged him,” Avena added. Marcos supporters are leading an online and house-to-house signature campaign for the late strongman amid 6 petitions opposing his burial at the Libingan ng mga Bayani. Ilocos Norte governor Imee Marcos had earlier expressed her support for the campaign for a hero’s burial for her father. “Nagpapirma po kami hindi lamang bilang suporta sa pamilya Marcos kundi ang kagustuhan naming mailibing na si Pangulong Marcos (We initiated the signature campaign not only to support the Marcos family but also out of our desire to finally bury president Marcos),” said Harrold Toledana of BBM Youth. Lawyer Hyacinth Antonio of the Marcos family said that they want to show the High Court that there are Filipinos who want the late dictator buried in the national shrine. The groups’ manifestation emphasized that Marcos was a former president and soldier. The petitioners in the case – mostly Martial Law victims – are also expected to file their manifestations on Tuesday. The petitioners have argued that the late president does not deserve a slot in the national shrine because burying him there violates Republic Act 289, which created the Libingan ng mga Bayani. Another group of petitioners have presented a “constitutional argument” in blocking a hero’s burial for Marcos.